Central Italy is counting the cost after it was again rocked by strong earthquakes, just two months after a quake claimed nearly 300 lives. Wednesday night’s twin tremors, two hours apart, are not being blamed directly for any deaths. But a number of mostly minor injuries were reported. Many residents of Campi, a town of about 200, slept in their cars as aftershocks rocked the Umbria, Marche and Lazio regions throughout the night. Police had blocked off the road to his home with a park bench, and Viola said a chapel beyond his house had collapsed. Euronews spoke to Giuliano Pazzaglini, Mayor of the village of Visso, at the centre of the quake zone. “We have focussed on people’s fundamental needs – food, water, toilets,” he said. Italian news agency Ansa reported that Pope Francis had expressed his solidarity. The earthquakes – measured at 5.5 and 6.1 magnitude – were followed by aftershocks. Authorities say the fact that the first tremor was weaker than the second probably saved lives as most people had already left their homes. 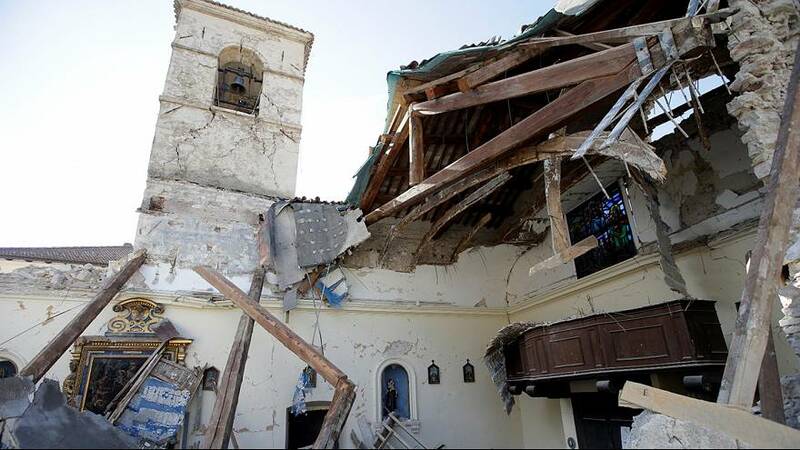 “Last night after the quake, there was a power cut and a storm with heavy rain,” said Mauro Camilloni of the Civil Protection Agency. Italian Interior Minister Angelino Alfano said that a decree now being voted on by parliament to pay for the immediate costs of the August tremor could be extended to cover the latest series of quakes.